For the 1997 remake, see That Darn Cat (1997 film). That Darn Cat! is a 1965 American Walt Disney Productions thriller comedy film directed by Robert Stevenson and starring Hayley Mills (in her last of the six films she made for the Walt Disney Studios) and Dean Jones (starring in his first film for Disney) in a story about bank robbers, a kidnapping and a mischievous cat. The film was based on the 1963 novel Undercover Cat by Gordon and Mildred Gordon. The title song was written by the Sherman Brothers and sung by Bobby Darin. The 1997 remake includes a cameo appearance by Dean Jones. 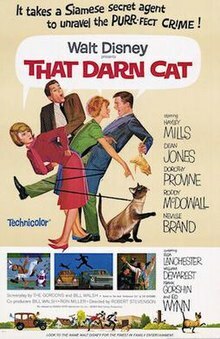 "Darn Cat" or "DC" is a wily, adventurous Siamese tomcat who lives with young suburbanite sisters Ingrid "Inkie" (Dorothy Provine) and Patricia "Patti" Randall (Hayley Mills) and enjoys wandering around town and teasing a local bulldog named Blitzy. One night, DC follows bank robber Iggy (Frank Gorshin) into an apartment where he and his partner Dan (Neville Brand) are holding bank employee Miss Margaret Miller (Grayson Hall) hostage. Miss Miller uses the opportunity to replace his collar with her watch, on which she has inscribed "HELP," and releases him to go home to the Randalls'. Patti discovers the watch on DC and suspects that it belongs to the kidnapped woman. She goes to the FBI and tells Agent Zeke Kelso (Dean Jones) of her discovery, and Supervisor Newton (Richard Eastham) assigns Kelso to follow DC in the hope that he will lead them back to the robbers' hideout. Kelso sets up a headquarters in the Randalls' house and assigns a team to keep the cat under surveillance, but, despite multiple attempts and a bugging system, DC eludes them in humiliating and comedic ways, culminating in a chase where he leads Agent Kelso through a several back yards and a drive-in theatre. As DC ends up trying to open a pidegon cage and is discovered by the owner Gregory Benson (Roddy McDowall) who is also Ingrid's carpool and chases DC and Kelso and out of frustration tells Ingred he quits being her carpool. The next day agent Kelso's supervisor Newton shuts down the operation, considering the evidence of the watch not hard enough, but Patti disguises herself as the hippie niece of her friend Mr. Hoffsteddar (Ed Wynn) the jeweller and persuades the FBI that the watch was indeed hard evidence. Patti and Kelso rescue Miss Miller and bring the robbers to justice. Subplots involve a romance between Patti's sister Ingrid and Kelso as he becomes her new carpool, and a romance between Patti herself and a surf-obsessed slacker neighbor, Canoe Henderson (Tom Lowell), and the meddling of nosey neighbor Mrs. MacDougall (Elsa Lanchester) and her disapproving husband, Wilmer MacDougall (William Demarest). At the end, it is revealed that the gray cat in the opening sequence and DC are taking their kittens on a prowl, having started a family. The exterior neighborhood scenes were filmed on The Walt Disney Studios backlot in Burbank, California. Each of the Seal Point Siamese cats who collectively play the role of DC are so-called "traditional" or "old style" Siamese, as opposed to the more dainty, long and tubular modern Siamese show cats. One of the cats used for the film belonged to longtime cat breeder Edith Williams, a member of the Stud Book Fanciers Association. One of the feline actors also starred, along with two dogs, in Disney's 1963 film The Incredible Journey. Bosley Crowther of The New York Times wrote, "The feline that plays the informant, as the F.B.I. puts it, is superb. Clark Gable at the peak of his performing never played a tom cat more winningly. This elegant, blue-eyed creature is a paragon of suavity and grace", and concluded, "...it's an entertaining picture. Even a king might profitably look at That Darn Cat." Variety said, "Walt Disney comes up with a novelty charmer in this lilting translation of the Gordon's [sic] whimsical tale of a Siamese cat who helps the FBI solve a kidnapping case." Philip K. Scheuer of the Los Angeles Times stated, "As a detective story, 'That Darn Cat!' is strictly for juveniles and the juvenile-minded. It contains little of the step-by-step development which in good detective stories brings out the sleuthing in all of us, being content to settle for a series of gags in which that darn cat, a brownish Siamese, leads the FBI and others on a number of false scents till he and we finally barge in on the criminals." Richard L. Coe of The Washington Post declared, "'That Darn Cat' is a dandy Christmas present for everyone except the Scrooges. Children will enjoy its pranks, adults its whimsy, cat-lovers its Siamese and even J. Edgar Hoover won't mind this use of the FBI." Brendan Gill of The New Yorker called the film "a typical product of the giant Disney flapdoodle factory, which for many years now has devoted itself to grinding out lavish falsifications of contemporary life." The film currently holds a 94% rating on Rotten Tomatoes based on 16 reviews. The film's writers, Mildred Gordon, Gordon Gordon, and Bill Walsh, were nominated by the Writers Guild of America for Best Written American Comedy. The film was also nominated for an Edgar Allan Poe Award for Best Motion Picture, and a Golden Leaf nomination for Best Supporting Actress (Elsa Lanchester). Mills won the 1966 second place Golden Leaf award for Comedy Performance, Actress. The Sherman Brothers won the third place Golden Leaf award for Best Song. ^ Wilson, Staci Layne (2007). Animal Movies Guide. Running Free Press. p. 16. ^ New York Times: That Darn Cat. December 3, 1965. ^ "Film Reviews: That Darn Cat". Variety. September 22, 1965. 6. ^ Scheuer, Philip K. (December 30, 1965). "'D.C.' Will Take Juveniles' Fantasy". Los Angeles Times. Part IV, p. 9. ^ Coe, Richard L. (December 25, 1965). "Disney's 'Cat' Fuel for Yule". The Washington Post. B7. ^ Gill, Brendan (December 11, 1965). "The Current Cinema". The New Yorker. 232. ^ That Darn Cat. Rotten Tomatoes. Retrieved April 14, 2019. ^ "Gold Key: That Darn Cat". Grand Comics Database.